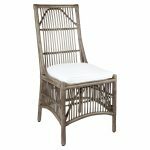 The Orient Bay cane dining chair style begins with the beautiful high back and comfortable seating. Complete with a removable seat cushion this chair is not only light and compact but very stylish. Available in: Matte White, Matte Black, USA Antique, Old Grey.